This is a very popular street food in South India, especially in Tamil Nadu and Karnataka. 1. Combine the first seven ingredients and mix well. 2. Keep aside for 3 hours. 3. Then add the onions, green chillies and coriander leaves. 6. Drop small balls of the batter and fry until golden brown. 8. Serve with coconut chutney. 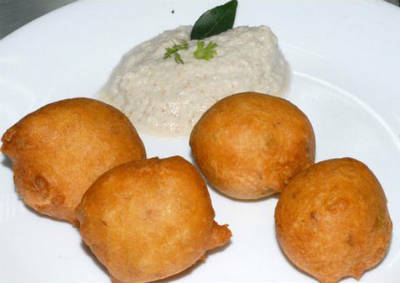 Feel free to comment or share your thoughts on this Bangalore Bonda Recipe from Awesome Cuisine.